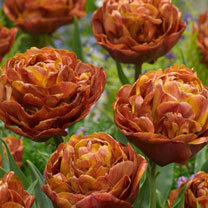 Brownie (Double) - Striking bronze coloured tulip with short strong stems. Flowers March-early April. Height 30-40cm. Bulb size 11/12cm. 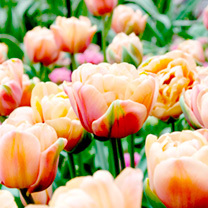 Belle Epoque (Double) - Stunning double tulip in nostalgic shades of pale copper through to apricot with a hint of mulberry and peony type blooms in mid to late spring. Flowers late April-mid May. Height 40-50cm. Bulb size 11/12cm. Brown Sugar (Triumph) - Exotic coloured Triumph variety. 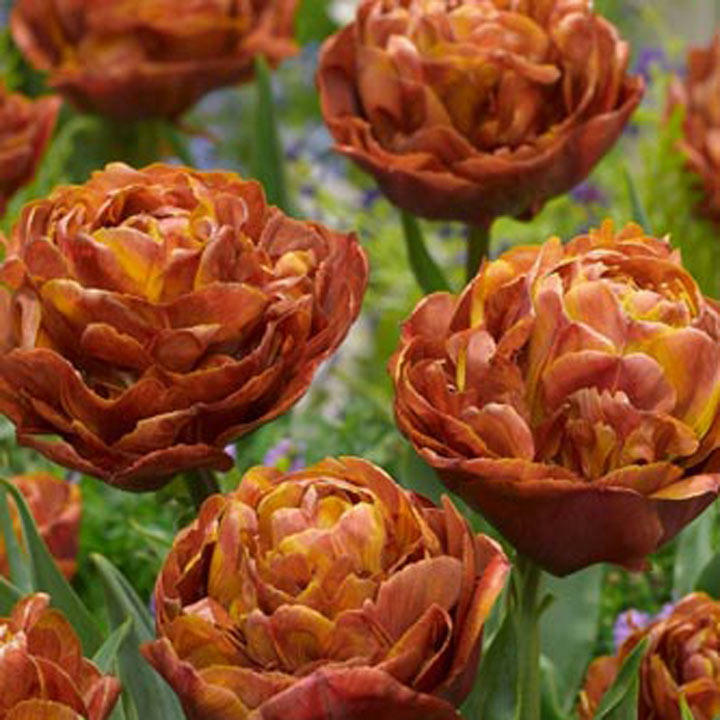 Copper and bronze shades combined with a subtle fragrance mean adding this superlative tulip to your spring display is a must. Flowers April. Height 40-50cm. Bulb size 11/12cm. Single variety. As a rule, plant your bulbs at least twice as deep as their height. So, a bulb that is 5cm tall will do best planted at a depth of 10cm. 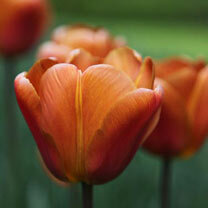 The exception being tulip bulbs which need a depth of about 20cm. This will prevent them for getting slugged and will encourage flowering year after year. Plant bulbs in ordinary plastic pots that will in turn fit inside your more attractive containers. Then, when they've finished flowering they can be removed, leaving the container ready for summer planting. When planting in fairly deep containers, try layering your bulbs. Start by placing the largest bulbs at the bottom, add a layer of compost and then the next sized bulbs. Repeat until you have the placed the smallest bulbs at the top, covered with a layer of compost. Bulbs don't like having damp bottoms (does anyone?) so make sure containers have plenty of drainage holes. When planting direct choose a well-drained spot where the soil is rich with hummus. When planting direct go for a natural look as opposed to planting in rows. The best way of achieving this is by gently rolling a handful of bulbs over the soil and plant where they land. If planting in a lawn remember that bulb foliage needs to be left to die down naturally. This will delay your lawn mowing activity so choose a spot where a clump of longer grass mixed with dying bulb foliage won't look too bad. Alternatively, go ahead and mow, replacing the bulbs in the autumn. Allowing bulbs to self-seed beneath trees and amongst shrubs means they will naturalise into drifts of stunning colour. To avoid digging the bulbs up by accident or worse, spearing them with a fork, mark where they are planted. Tulips are best planted late, in November or even into December. Make planting easy by using a bulb planting tool. Both long and short handled versions are available. The added bonus being that the correct planting depths are clearly marked. Ideal for beds and borders, patio pots and containers. Suitable for cutting. Grows well in sun or shade.